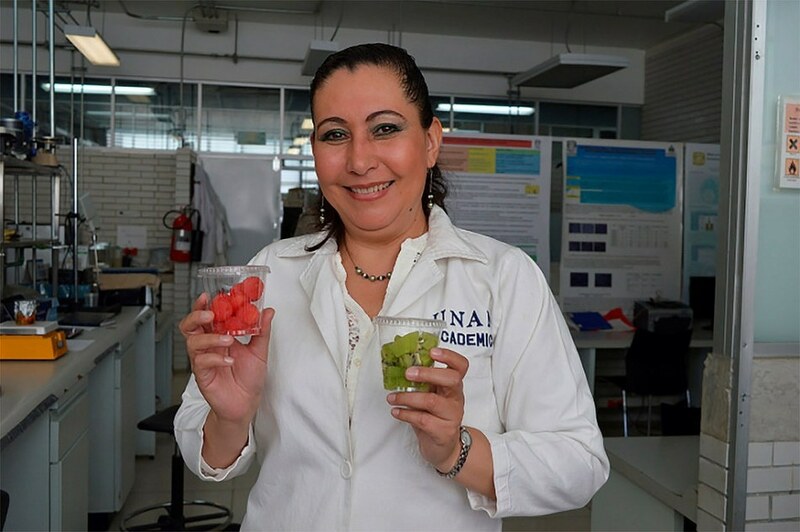 An edible coating has been developed by UNAM researchers with the aim to extend the life of vegetables and fruits and preserve them for prolonged refrigeration. This coating with added purposeful ingredients could be applied to freshly cut foods. Dr. Maria de la Luz Zambrano Zaragoza, researcher at the Faculty of Higher Cuautitlán (FES) Cuautitlán, explained that the advantages range from having a cut fruit attractive, "by oxidation, many fruits no longer consumed with this technology, crop losses will decrease also retain nutrients from fruits or vegetables”. Using a university developed technology, cut up apple could be preserved up to 25 days and a kiwi for two weeks. But their production is expensive - it costs 70 pesos a liter of dispersion to coat 20 kg of cut fruit to be placed in convenience stores and consumed later. After nine years of research, researchers have discovered that if nanocapsules filled with alpha tocopherol and beta-carotene in fresh-cut vegetables and fruits are dispersed, homogeneous film develops, which inhibits enzymatic browning and extends the life of these foods. "The microencapsulated we design are food additives with a similar to that of a ball of nanometric size ranging between one hundred to 500 nanometers structure internally can place you active substance such as lemon oil or rosemary, or antioxidant alpha tocopherol or beta-carotene; drops out of this area of the active substance through the wall that migrate to the fruit achieving their conservation”, explained the academic responsible for the investigation. The coating cannot be visibly seen due to immersion method applied to the fruit surface and the active substances are absorbed, leaving the product ready to eat. Additionally, coatings with a variety of flavors can be developed in order to make the product appealing. Scientific development already patented and secured first place in the "Development Program Patenting and Innovation" awards (PROFOPI 2015-2016). The purpose is to boost a culture of industrial property at UNAM. Following this, researchers aspire to develop a pilot plant for industrial production. One of the interests of the UNAM is to contribute to society with useful technologies that can be marketed well and export.